Donald Trump used Twitter to defend himself against familiar foe Hillary Clinton on Wednesday. Clinton, who stood against Trump in last year's presidential race, has written a book entitled What Happened, where she tells her side of the election loss. In it she pins the blame on numerous people, including former FBI director James Comey and Russian President Vladimir Putin, for how the vote turned out. Now Trump has responded in his typically abrasive style, and via his preferred form of media. 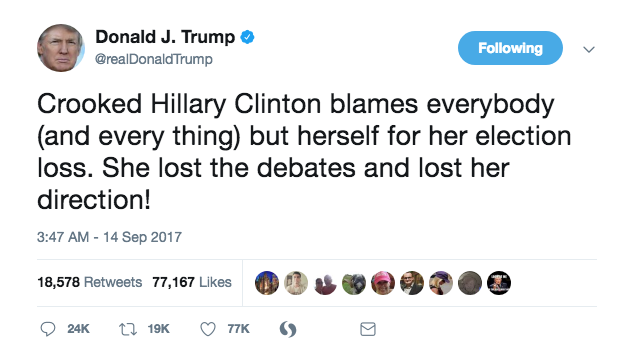 Referring to her by the name of 'Crooked Hillary', which he coined during the campaign, the US President blasted Clinton for "blaming everyone but herself" for losing the vote. Then there was a dig about Clinton's alleged campaign spending. 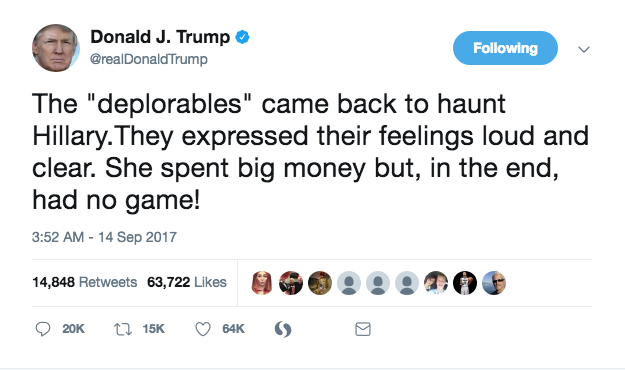 Trump - whose own campaign wasn't exactly thrifty - said Clinton had spent "big money" but had "no game."